Create your own little Mother’s Day Keepsake. A special way to save those hand prints as they grow bigger. I just went to Michael’s and bought a spiral bound book with blank pages (in the art section) and a bottle of paint (washable, of course). Then I came home and decorated the cover. 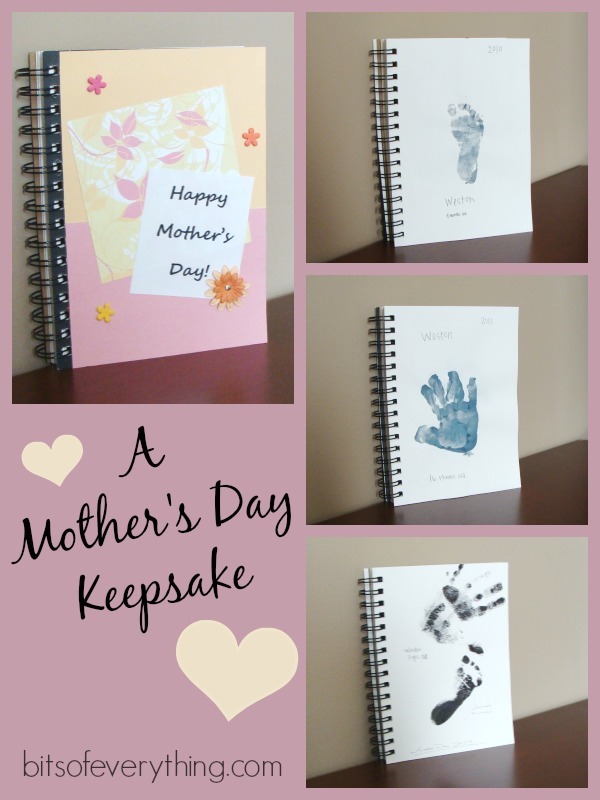 The idea is that each of my children will put a hand print on a page each Mother’s Day. That way I can look back on how big or little they were each year. Someday when my kids are a little older, I hope they will write their name by it, and their age. Maybe sometimes they’ll write a little note with it. So like I said, last year I thought this up, and went and bought the stuff… I was all excited about getting my baby’s handprint. Has anyone ever tried getting a 4 month old baby to open their little hands? It’s tough!! So we ended up getting his foot print instead. It’s amazing how much bigger his little foot is this year than last year! But this Mother’s Day I think we’ll try to do the hand print idea again. Hopefully the paint doesn’t get all over the place! This little book is already a keepsake to me. I love it. 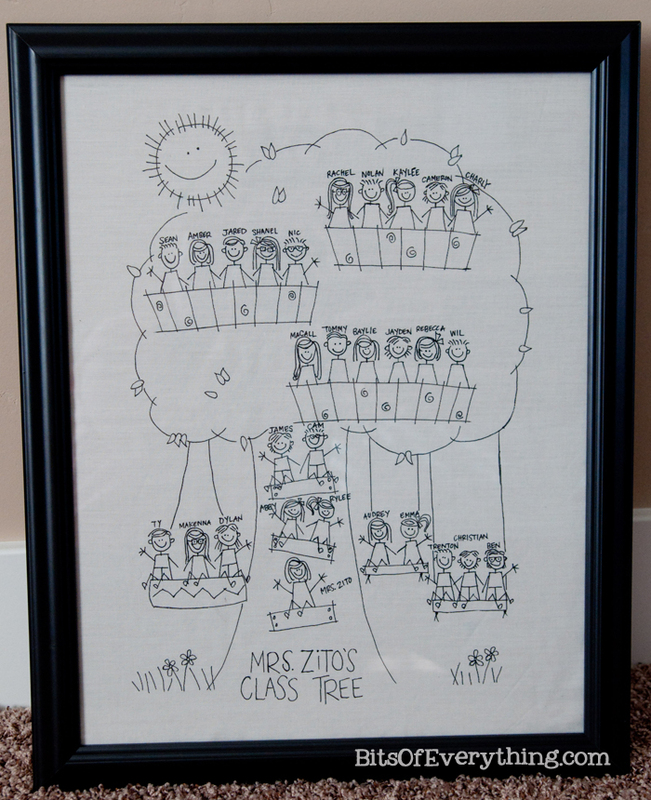 Here is a great Mother’s Day and Teacher Appreciation Idea! Finding a gift for my Mother-in-law is kind of tricky. We’ve already given her all the usual gifts of flowers, books, gift card, etc… So, I’m always on the lookout for something to give her. Luckily, she loves homemade gifts. As soon as I saw this post on Helping Little Hands about Faux Embroidery, I knew that was what I needed to make for Mother’s Day this year. I purchased the pattern from Twin Stitchers. She is having a deal this month that if you spend over $10.00, you will get 50% off your entire order! 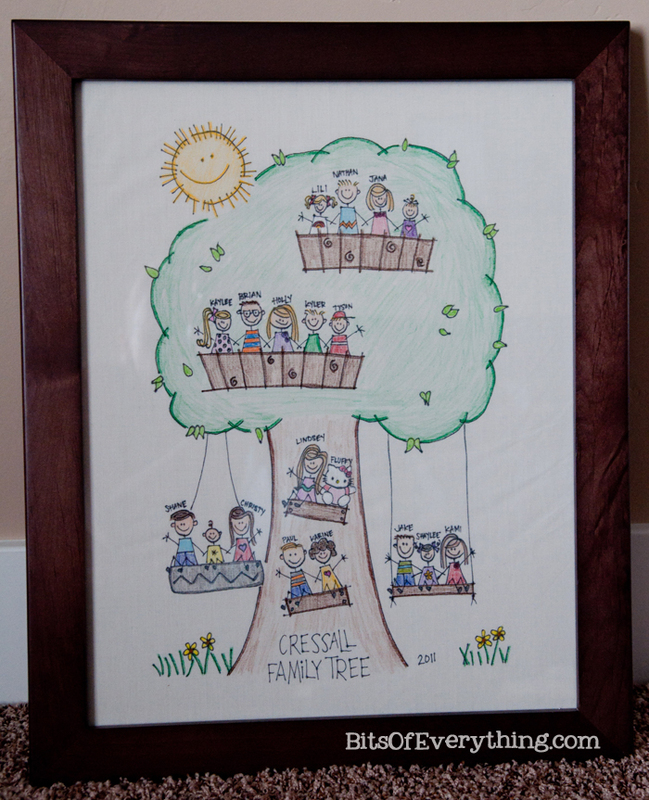 So my “Our Family Tree” E-pattern was only $6.50!! Such a deal! Once I started coloring, I just couldn’t stop. It was so fast, easy, and fun! While I colored, my daughter watched. She thought it looked so fun, she kept asking if she could color some. I was particular about my gift, so I told her we could make another one for her to color. We decided it would be fun to make one of her school class to give to her teacher. So, we did our best to fit the whole class on to the tree. I just love how it turned out. Kaylee is so excited to color it for her teacher. Unfortunately, she has a lot of homework to get done first. I’m hoping this will be some good motivation to get her to move a little quicker. – These are 14 X 18 inch frames. The brown one was $20 from Target and the black one was $10 (50% off) from Hobby Lobby. 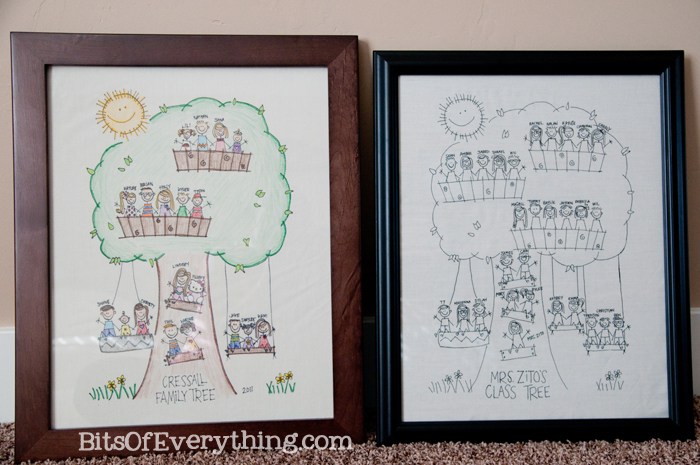 – On the Class Tree, I made the tree slightly bigger on the right hand side so that we could fit more kids on it. – The link to Helping Little Hands is a tutorial with a lot of helpful information. She suggests what kind of pen and crayons to use and tips to make it easier.